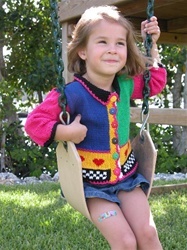 What a great cardigan for either boys or girls! Sized for 18 months, 2T, 3T, 4T. Super 10 mercerized cotton is the perfect yarn, and the buttons plus an instructional DVD come with the pattern! An adorable but sophisticated design that would be very pricey in a fancy children's shop, if you could even find it. Plus if you are new to color work (fairisle and intarsia) this is simply a great way to try it, with a smaller more limited project. You'll find out it's not as hard as you think!